Can the shape of the “KitKat 4 fingers” chocolate bar be granted registration as a 3-D trademark of the European Union? In a decision that provides new guidance on how to prove acquired distinctiveness of a sign in the European Union, the Court of Justice has confirmed the General Court’s decision, meaning that the EUIPO will have to issue a new decision on the validity of Nestlé’s 3-D EU trademark registration. The EUIPO granted Nestlé a registration of the shape of the “KitKat 4 fingers” chocolate bar as a 3-D trademark of the European Union in 2006 (at the time, the EUIPO was called OHIM and the trademark of the European Union was known as the Community Trademark). The following year Cadbury Schweppes (now Mondelez) applied for a declaration of invalidity of the registration, claiming that the shape lacked the required distinctive character. The EUIPO rejected the application, taking the view that the mark had acquired distinctive character through use in the EU, although such acquisition had been proved in ten countries only (Denmark, Germany, Spain, France, Italy, the Netherlands, Austria, Finland, Sweden and the UK). Mondelez appealed against the EUIPO’s decision before the General Court of the EU (General Court), whose judgement of 15 December 2016 in case T-112/13 annulled the appealed decision on the grounds that the EUIPO could not conclude its examination without ruling on the relevant public’s perception of the mark’s distinctive character in all member states of the EU (at the time, the states listed above plus Belgium, Ireland, Greece and Portugal). On 25 July 2018, the Court of Justice of the European Union (CJEU) issued its ruling in joined cases C-84/17 P, C-85/17 P and C-95/17 P concerning the appeals brought by Nestlé and the EUIPO against the General Court’s judgement. The decision confirms that the General Court was correct in annulling the EUIPO’s decision. The CJEU relies on its own case law to establish that a sign without inherent distinctive character can be registered as an EU trademark only if it is proved that it has acquired distinctive character in the part of the EU – which might consist even of a single EU member state – in which it did not previously have such a character. The CJEU therefore concludes that for the purpose of registering as an EU trademark a sign that was formerly devoid of inherent distinctive character, evidence must be submitted that the trademark has acquired distinctive character in the EU member states in which the sign was originally devoid of inherent distinctive character. The ruling points out that evidence must not be necessarily submitted for the entire European Union – unless the sign was originally devoid of inherent distinctive character in the entire European Union. In the case at issue the KitKat 4 fingers sign had been found to be devoid of inherent distinctive character throughout the European Union, and therefore it was not sufficient to prove that it had acquired distinctive character through use only in a part – albeit a significant part – of the European Union. The CJEU also points out in its decision that EU law does not require that the acquisition of distinctive character through use be established by separate evidence for each EU member state: evidence for use of a sign within a cross-border market comprising more than one state (for example, two states in which the same language is used) can be considered relevant. 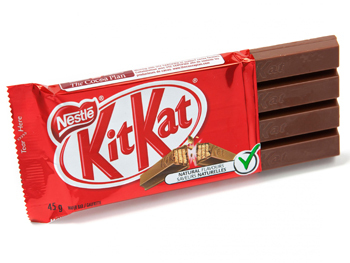 The EUIPO will now have to re-examine the application filed in 2007 by Mondelez for a declaration of invalidity of the “KitKat 4 fingers” trademark registration granted to Nestlé.